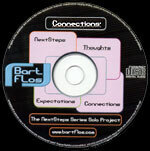 To go to NextStepsProjects (2006) click here. Most of the tracks on this CD are played real time and are unedited in terms of cutting and pasting. What you hear is what’s been played. It allows me to both seek for new sounds, melodies and songs and to record any spontaneous song that pops up, depending on my mood. It’s a great way to reach a professional recording by relatively simple methods and tools and in a relatively short period of time. And don’t forget: by recording four tracks simultaneously you experience the effect of direct stimulant on what’s being played. This compared to recording track by track in which case already recorded tracks are not able to ‘respond’ to what’s happening at that moment. 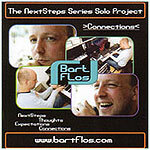 This fifth CD, Connections, consists of songs and compositions that are a combination of jazz, blues and pop with dance, house, techno and jungle. As stated before it has never been my ambition to compete with all the professionals and specialists on this field. It is just my way of pointing into possible directions of collaboration and new fusion of styles. Ultimately I hope to be able to connect and do more projects with musicians that have specialised in this field and in these new forms of music. And last but not least, I hope to show that it is a lot of fun to take a step towards relatively new combinations of musical styles, especially as a jazz or blues musician. Well, listen for yourself. MTR/ ] Multi Track Recording ‘from scratch’: track by track composed, arranged, recorded and pre-mastered in the main studio. This is the lead song of this album. This melody has been lingering in my head a long time before I had a chance to record in a more contemporary style. The RD700 provided the techno-house beat and the groovy sounds of which I used a few great ones from the expansion board ‘Supreme Dance’. I recorded multiple tracks to add to the atmosphere of the composition but it is basically a ‘pop’ type of house song. This started as a joke surrounding the recording of It’s A World Gone Mad. Tracks 2, 3 and 4 are actually one complete song of over 8 minutes but you have to walk up the isle of madness to reach the core song and down the isle again to reach the exit. The isle itself aims to create the impression that you are walking up the corridors of a music school (footsteps, heart beat), hearing musicians practicing and rehearsing their music. You can hear all kinds of instruments left and right, of course real time recorded on the RD700. At the end of the corridor you reach a room in which the world has gone mad. Big hits and beats and squeaky voices lead you in there and than you’re trapped for more than 4 minutes. This is the core song of all the madness. After the pre-recording in my studio I have added a strong acoustic blues piano to it with a weird free piano solo in the middle, fighting the bass player and trying to get him off of my back. Towards the end of the song you are meant to turn around and step back out of this room where the big hits and beats and voices push you to walk down the isle again. If it started out as a joke why not end it with a joke? Another contemporary house song completely recorded in the main studio. The melody tracks were prepared in my home studio but all the different tracks were added in the main studio. It’s basically a ‘samba in disguise’ and hopes to combine the atmospheres of both latin and house music. For this composition I used one of the many great ambient sounds of the RD700. It creates a magnificent atmosphere by using both low and high registers and this particular sound patch inspires me to combine changing chords on dark and deep down pedal bases until the song ‘breaks’. Starting out with the ancient scratch of an LP, this composition is a good example of the combination of more contemporary music with jazz and funky influences. The core song has been pre-recorded in my studio and the introduction and endings were set up in the main studio. The Fender Rhodes provides the minor blues melody and chords whilst the flutes lay down the carpet. The bass combined with the house beat again provides a samba-like feel to the song. If you are a Dutch native and really listen carefully you might hear reminiscent elements of the Dutch traditional folk song “In Holland Staat Een Huis”. If you are not, you will hear a pop-like song with an easy listening Fender improvisation and some duo melody lines with the fretless base. It’s just a friendly, easygoing pop song. Drums, chords and ambient sounds were pre-recorded. The melody and improvisation were added in the main studio. ‘Jungle’ is a typical contemporary style of music that incorporates the characteristic absence of a bass note on the first beat of each bar. I wanted to combine this beat with Fender Rhodes improvisations, which was pre-recorded in my home studio. The introduction and background ambient sounds were added in the main studio. If you like this kind of music you will find the extended version of Jungle Fever under Bonus Tracks in this part of my web site. This ballad is based on the same drum patch as There Is A House In Holland but this time no tracks are added. What you hear is how it has been pre-recorded at the time. This is relaxing pop music with jazz and blues influences. Back to my roots again: solo on the Fender Rhodes. The Rhodes on the RD700 sounds even better than on the RD600 and both attack and sustain have been improved. It has a great low base to use when improvising which creates great opportunities to ‘jazz and funk around’. This is a one time / real time recording from beginning to end and it contains different styles and beats of feel and music.